HENLEY Rugby Club has been fined £1,000 after using the services of an unregistered agent. The punishment relates to the signings of front row forward Barnaby Abdale-Weir and half-back James Stevenson-Wright. The Rugby Football Union’s independent competitions hearing said the club’s failings were “serious” but “not intentional”. The National League 2 South club was also handed a suspended 10-point deduction until the conclusion of the 2017/2018 season for engaging the services of agents from Inside Running Recruitment, based in New Zealand. This will be activated in the event that the club is found to have breached RFU regulation 8, relating to agents, again prior to that time. Both players were also given reprimands for appointing an individual from the company. The judgement said that in advance of the hearing “all parties had provided written confirmation that they each accepted having acted in breach of RFU regulations”. It continued: “The breaches of the RFU regulations by Henley are clear and given the relative severity of the breaches, the RFU is of the view that a financial penalty of £500 should be imposed in respect of each charge. Aubrey Doran, director of rugby administration at the club, accepted the sanctions. In a letter, he said: “On behalf of [the club], I apologise for the non-compliance and wish to convey that we have now completed an internal review to ensure a repeat of the breach does not occur again. “All those directly involved in the administrative activities within [the club] have been made fully aware. At no point have any representatives deliberately sought to avoid compliance. “On this occasion we should have been more aware of the arrangements surrounding the use of agents. Both Abdale-Weir and Stevenson-Wright accepted their reprimands, saying they had been unaware of the regulations and did not receive advice from Inside Running. 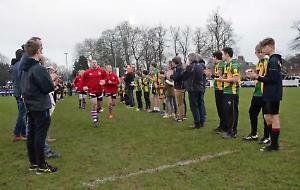 Nigel Dudding, the Hawks’ director of rugby, said the issue had only come to light due to the club’s own honesty in completing the appropriate agent registration forms. Abdale-Weir left the club at Christmas and returned to his native New Zealand, while Stevenson-Wright still plays for the club.